The library itself is very easy to use, even though for some customizations and changes you need to go through the code. But everything is “where it should be” and well commented. 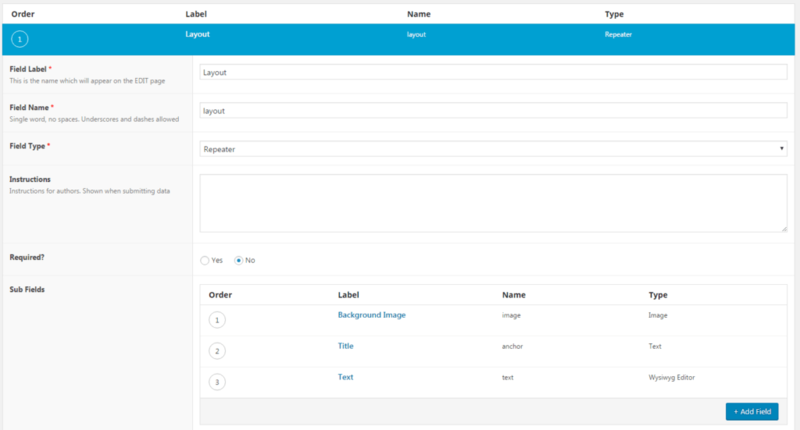 Given the popularity of Advanced Custom Fields plugin and the way the library works – specifically menu items and sections – I was thinking about finding an easy way to create all the sections only from one page using Repeater field, at the same time allowing people to add new menu items easily without the need of any programming knowledge. The code I created is indeed lightweight and quite different than other themes, even though I didn’t care much to search if anyone had the same idea regarding ACF/fullPage.js integration. Please note that Repeater field is part of ACF PRO, which means you’ll have to pay some money for it. Need help with your WordPress theme? Hire Bruno Kos and let him work his magic for you! I’ve created this theme only to be used as a full page layout, using the library. That’s why some pretty standard WordPress stuff has been left out, such as standard loop within index.php template. No worries – wp_head() and wp_footer() are both included. The code is indeed minimal, while CSS has been taken from Twenty Sixteen theme. I’ve also added a smaller amount of my own CSS, but design, in general, is not important throughout this tutorial as it is likely that whoever will use this theme will design their own stuff. So, here’s the deal – create a blank page and make sure that you set it as a static page within Settings -> Reading menu item. This is our starting point and without this, it will not work. Besides Font Awesome I’ve included for my own fun, I’m sure you’ll notice fullpage.initialize.js script as well – we will get to that later. You will not find many changes here, but with an exception – the function increment(). What does it do? This is an extremely simple function which adds increments for each new “slide” – this was my personal preference simply in order to keep the whole code clean. You can use any other name instead of “slide”, even though I don’t see the purpose of changing it. If you check the core file, you will also find all these options, but there is one we are particularly interested in – anchors (a bit more) and navigationTooltips (a bit less). Without these anchors, our menu would not work so the visitor would be able to scroll through pages only via mouse wheel or keyboard. Therefore, we need to add several anchors – for this purpose, I’ve added 10 of these which is I think sufficient for most projects, even though you can add more if required. But I seriously doubt that you will have 15, 20 or more menu items – pages. 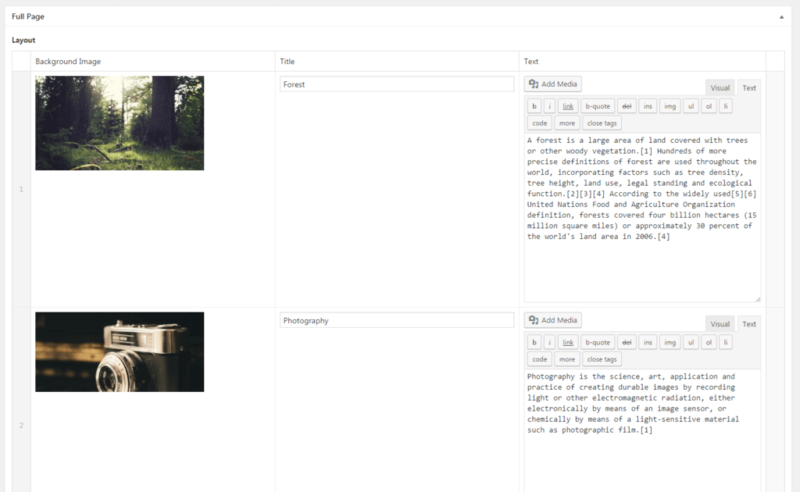 This is where we meet the main idea – Repeater fields for generating fullPage.js pages. Also, I registered few other fields within our Repeater, one for the background image, one for the title and one for text. In order to keep the tutorial short, I will provide you with ACF export file at the end of this article, but this is how the structure looks like – even default values work so there really isn’t anything spectacular here. 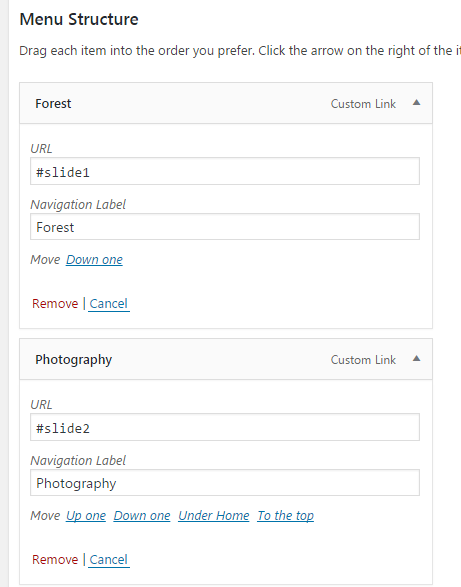 You’re free to modify the layout of these fields as you wish, but don’t change Field Names, unless you change them within the code as well. I really hope you enjoyed this tutorial and I hope even more that you will use my starter theme for creating your next awesome theme for your clients! Need a new WordPress theme or any theme customizations? Hire Bruno Kos and start working with him immediately! Must say that most of the customers requirer to use it only for the horizontal slides, which i used to create carousels of contents, but i had to do a big js work do manually disable only the vertical effect and leave horizontal section.